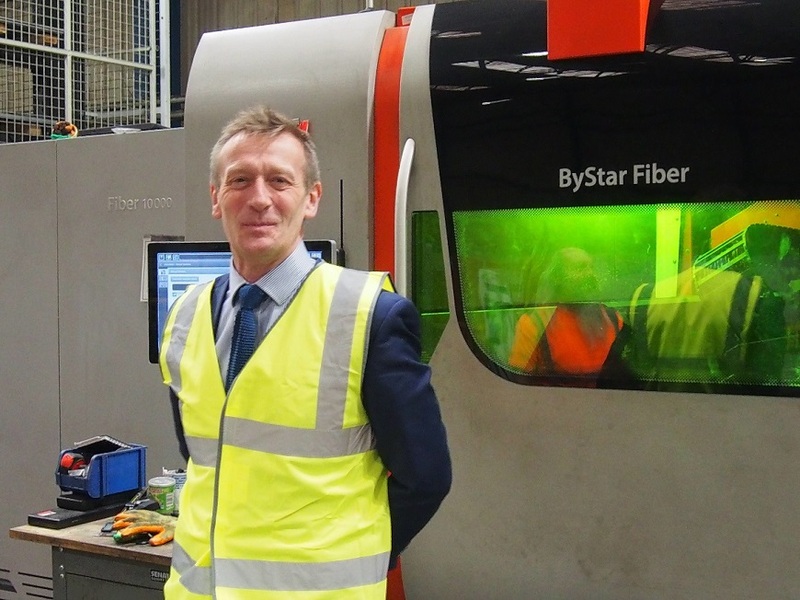 Interview with Mr. Austin Jarret, Managing Director of the British company SSC Laser Cutting. SSC Laser Cutting has three plants and manufactures laser cut and folded parts for agricultural and body on to chassis manufacturers in the UK. The company has recently started its digitalization process. Can you tell us about the history of SSC Laser Cutting and its business? I am also the Managing Director of Allett, which manufactures golf course machinery, where we subcontract around £30,000 per month of laser cutting work. We evaluated the purchase of a laser to bring the work in house but decided that this would result in inefficient use of the laser machine and hence our investment, leading me to set up SSC Laser Cutting in 2000. SSC Laser Cutting now manufactures laser cut and folded parts for agricultural and body on to chassis manufacturers in the UK. Allett is now just one of its many customers. SSC Laser Cutting’s objective is to enable British manufacturers to be efficient and responsive. We have empathy with our customers as Allett uses SSC’s services so, we are in the unique position of understanding the requirements and challenges of both customer and subcontractor. The company has three plants: Yate which has flatbed lasers and press brakes and specialises in non-ferrous materials to avoid cross contamination; Derby, which has flatbed lasers and press brakes; the head office in Hixon which has both flatbed and tube lasers as well as press brakes. In addition, the company has sales offices at each plant and a further one in Kent. The sales offices quote for work regionally and orders may need to be supplied from multiple sites. For example, tube parts from Hixon and brass components from Yate, with coordinated delivery of the order to the customer. To do this we need visibility of capacity across all the sites. Why do you think that digitalization is important? Subcontracting laser parts used to be a minor miracle, cutting intricate profiles which were impossible before. Now laser cutting has become a commodity technique, so there has been a significant change in how subcontractors operate. Lasers are now so fast that keeping them running all the time depends on other factors such as the ability to quote quickly and accurately, automation and, for satisfied customers, fast and on time delivery. It’s not about cutting any more, it’s about many other aspects of company organization. Historically, subcontract laser companies are run by entrepreneurs with one or two lasers, which can be controlled by wit and ingenuity. These companies will find it difficult in the new subcontracting laser cutting market, as customer and supplier relationships will get closer with digitalisation. Understanding the performance of multiple machines will be necessary to ensure parts are delivered when promised and at a competitive price. Having data which will result in transparency for the whole business - pinpointing costs where they are incurred, monitoring production efficiency, showing capacity and its utilisation, tracking material costs, machine efficiency and up times, on time delivery reports etc. will make it possible to provide a far better service to customers, which smaller subcontractors will find hard to replicate. What is SSC Laser Cutting’s view of the future of digitalisation in the sheet metal industry? Providing an excellent service to the customer at the right price is the main objective. We generate around 3,000 quotations every month with 1,600 orders per month and 141,000 different parts made every year. For our own business we need useful figures like performance against target rates /hour for the machinery and how much we earn on each part. This is important as we want to keep profitable work and not have poorly performing parts subsidised by the more profitable jobs. To achieve this, costing has got to be highly accurate. The penalty for not doing this could be a gradual loss of the jobs which are doing the subsidising. Our objective for the future is direct communication with customers and suppliers so that customers can order online with artificial intelligence helping to generate the majority of the quotations and customers able to see the progress of their parts through the workshop. Similarly we want to have the same level of integration with our material suppliers so that we can see the price and availability of material ‘now’. We even need to work digitally with our transport partners so that we can schedule deliveries, tracking them to give the best possible customer service. The ability to do these things relies on communication between systems, online interfaces and the ability to analyse quickly the vast amounts of data involved. What is SSC Laser Cutting’s view of Cloud computing? We have a lot of IT kit at each site which needs to be replaced regularly. Currently we also have two full time IT specialists to maintain the systems. Moving to Cloud computing will eradicate the need for expensive hardware, provide us with more secure backup and disaster recovery and, enable us to use our in house IT expertise for strategic improvements rather than just for maintenance and infrastructure management. In addition, Cloud computing will increase our flexibility, allowing us to do home working and have easy access to data from anywhere around the world while maintaining security. How will the smart factory and intelligent machines communicating through the Cloud develop? Machine manufacturers are connecting their newer machines over the internet, enabling them to monitor machine status and performance, avoiding unnecessary breakdowns and enabling planned maintenance. Lantek’s close relationship with Bystronic, the machines we use, is valuable as the integration will deliver useful information which we can use in making prices even more accurate. Our objective is to look at historic information and use this in intelligent systems to consider the many variables from delivery times to product features and automatically generate prices and compare this with what actually happened. How does SSC Laser Cutting anticipate it will benefit from digitalisation? Our plan is to grow from our current turnover of £16 million to £50 million by 2025. We can only do this with a scalable system that gives us useful digital information. Some of the smaller laser subcontractor businesses will not be sustainable in the face of digitalisation, so some of our growth may come from acquisition, where we would implement digital processes as part of that acquisition. Customer and supplier loyalty will be a major benefit of digitalisation. The closer we work with customers, providing transparency and excellent service and prices, the more loyal they will be. Similarly, working closely with suppliers will ensure we get the best levels of service and also economies of scale. The measurable benefits will include reduced inventory for us and our customers and reduced downtime risks with just in time deliveries. With the data we collect we can analyse facts which will enable us to make informed decisions about improvements around the factory, such as automation of processes. Without this information we cannot make objective decisions. For our sales teams, we have the ability to gather a huge amount of valuable data in our CRM system. We can record and investigate for example, what proportion of a customer’s business we are getting and why, the geographic spread and density of customers and the status of each customer. With the 1000s of calls we make, we can use this information to generate new business. Why did you choose Lantek as your digital partner? Lantek has a vision and an understanding which matches our requirements. 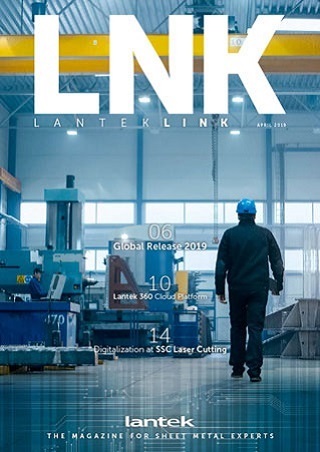 We anticipate that our future plans for integration with customers and suppliers will become a reality with help from Lantek, taking us on the road to Industry 4.0 and our target of £50 million by 2025.